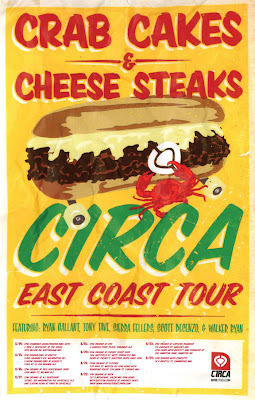 The ‘Crab Crakes and Cheese Steaks Tour’ will be hitting the eastern seaboard - kicking off on August 14th. Ryan Gallant, Sierra Fellers, Tony Tave, Scott Decenzo and Walker Ryan will be hitting shops and skate parks heading up through Maryland, Delaware, New Jersey, Massachussets and New Hampshire.Check out recent Dialog interviews and footage for Gallant, Walker and Decenzo by visiting www.C1RCA.com/dialog. See the poster for full details of each stop or go to www.C1RCA.com.